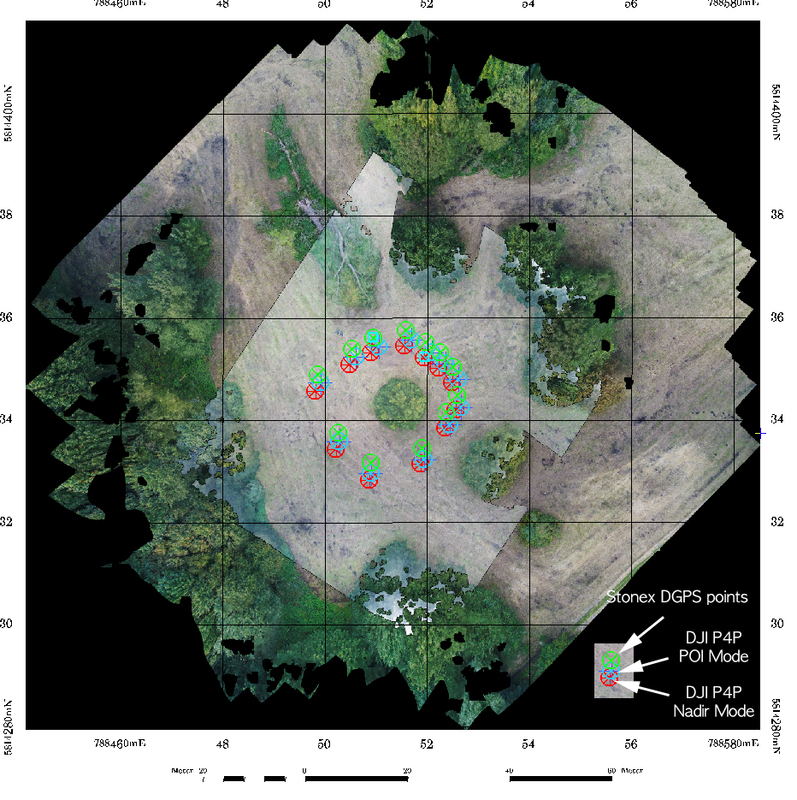 Some results from DGPS point measurements with a Stonex S9III GNSS DGPS receiver indicate an offset of 1.5-3 m to the Phantom 4 Pro ortho mosaic images. The relative accuracy is however much better. The Phantom 4 Pro derived ortho mosaic (without reference points) has a standard deviation of 0.31 to 0.36 m.
When comparing the overall positional accuracy of the reference points its surprising that the UTM coordinates that come directly from the Phantom 4 Pro are not far off: I measured 12 DGPS points and found that the offset is between 150 cm and 290cm (compare with Fig. 6). RMSE between the Stonex S9III DGPS (SAPOS) measured points and the DJI Phantom 4 pro POI mode ortho image mosaic measured points is 1,98 m (stdev 0,31 m) and the RMSE between the Stonex Points and P4P NADIR mode ortho image mosaic measured points is 2,95 m (stdev 0,36 m). The difference is clearly also depending on overall atmosphere conditions and Stonex DGPS accuracy. Fig. Comparison of measured DGPS Stonex GNSS points with in-Copter derived GPS geometry in POI ortho mosaic and with Nadir ortho mosaic processed in Agisoft in September 2017.